This item will bring industrial flair into your home without overstating it. 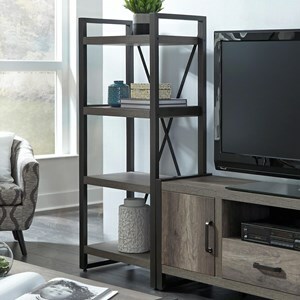 Warm, distressed wood paired with square, steel legs and accents. This collection includes Bedroom, Occasional, and Media/Storage pieces. 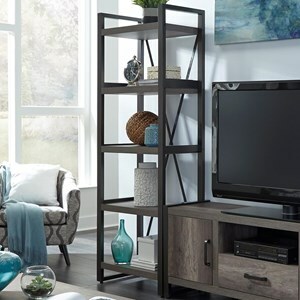 The Loftworks 22" Pier Bookcase by Jofran at Van Hill Furniture in the Grand Rapids, Holland, Zeeland area. Product availability may vary. Contact us for the most current availability on this product. Storage Shelf Dimensions: 18" x 18" x 10.5". Bottom is 6" off floor. Middle shelf sits at 32", making it a great companion to either the 54" or 60" Loftworks Trolley Carts.